Lake Ontario is pretty great (pun absolutely intended) and a veritable freshwater ocean. 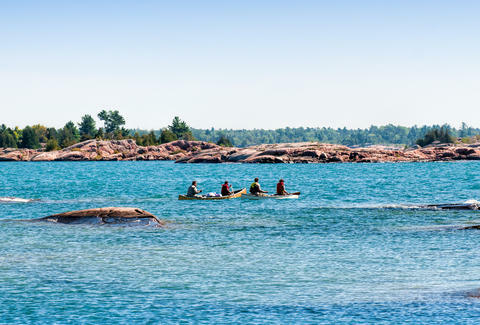 But when you’re feeling a break from the crowds at some of Toronto's local beaches, hop in the car with some friends for a lakeside adventure further afield. These lakes within driving distance of Toronto will help you beat the last of the oppressive heat of this Canadian concrete jungle and almost, just almost, make you wish it was summer in the city for another six months. Kelso Conservation area is a short 45 minute drive from Downtown Toronto, and not only can you luxuriate on Kelso Beach for a paltry $6.75 entry fee, the park also has picnic areas and a great trail hiking when you're over sitting lakeside. The calm waters on this man-made reservoir lend themselves to excellent canoeing and stand-up paddle boarding. Rent a board and come armed with your portable BBQ and a 24-pack. 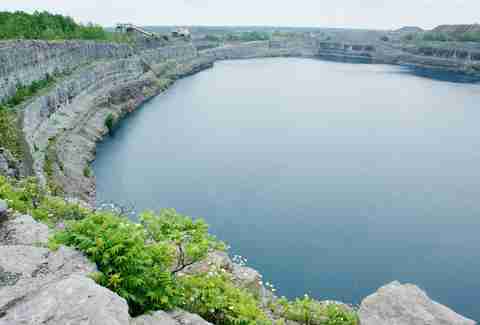 Engineers blasted through 120ft of limestone to create the successful Marmoraton Mine that operated from 1955-73; by the time it closed, it had mined almost 1.3 million tons of ore. The results? A gaping hole in the ground that eventually filled with rainfall and underground streams to create the “lake” we know today. Come prepared as there are no amenities whatsoever, and lake-going is reserved for those who dare to take the plunge off the side of the mine. Time for an epic backflip? Sibbald Point on Lake Simcoe is your go-to for glamping on a budget. Endless sandy beaches, picturesque campsites available to reserve, raccoons that are are relatively under control, and hell -- there are even real, live, flushing toilets. Only an hour’s drive from Toronto, this lake is known for its excellent, if busy, beaches and loud, late-night campsite dance parties. You've been warned. McCarston’s Lake is located in the geologically rich Mono Cliffs Provincial Park on the Niagara Escarpment, where you can hike to your heart’s content and never see another soul. Hit up the spelunking and rock climbing areas before cooling off at McCarston’s Lake. Situated in the lush greenery of the park, you’ll feel as if the steamy streets of the 6ix are another world altogether. Great news -- there’s more than one Great Lake in these here environs. 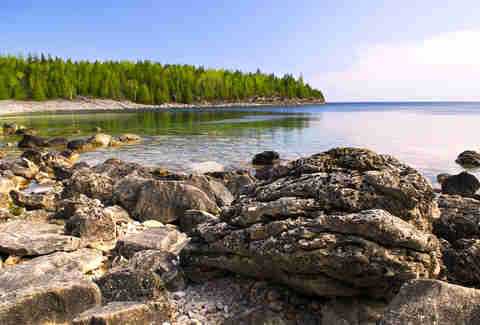 Drive two hours north and find yourself on the shores of Georgian Bay, Lake Huron. The town of Wasaga Beach boasts 14km of white sand (the longest freshwater beach in the world! 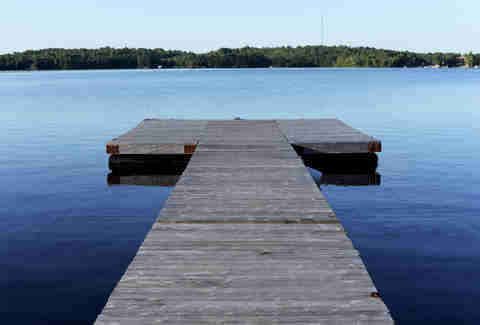 ), well-kept facilities, and warm, shallow water. There are eight different beach areas to choose from, and plenty of beachside beer vendors. Be sure to stick around for the extremely Instagrammable sunset! If you're itching to go scuba diving but simply cannot afford that trip to Belize right now, Trout Lake has the answer. Shipwrecks, airplanes, school buses, a mine shaft -- you name it, they sunk it in Trout Lake. Anything goes here -- you can crack a beer, dive off the cliffs, bring your own raft, play your own music, BBQ the raccoons; not necessarily in that order. Our suggestion: the water is freezing year-round, so wait for a scorcher to hit up this quirky little lake. Sarah Cooper is a Toronto-based writer still working up the guts to cliff dive. Catch her on Instagram at @agirlcalledcooper.